Can a Five Year Old Take Tums? Like adults, many 5-year-old children experience the occasional bout of stomach upset or heartburn. While some parents may be tempted to give their children regular adult-strength Tums, adult medication is rarely safe or appropriate for 5-year-old children. When giving your child Tums or other antacids, you must be sure that the medication is safe for your child's age group and that you are administering it under appropriate circumstances. When in doubt, always consult your child's doctor before giving your child even seemingly benign medications. Regular Tums antacids should not be taken by children younger than the age of 12, unless under the direction of a doctor. This pertains to those using Tums as an antacid and also to parents looking for a way to add calcium to their child's diet. Tums also makes a product called Tums Kids, which is designed specifically for children between the ages of 2 and 11, making them safe for 5-year-olds. Consult a doctor before giving your child Tums Kids and ask about how the Tums may react with any of your child's other medications. 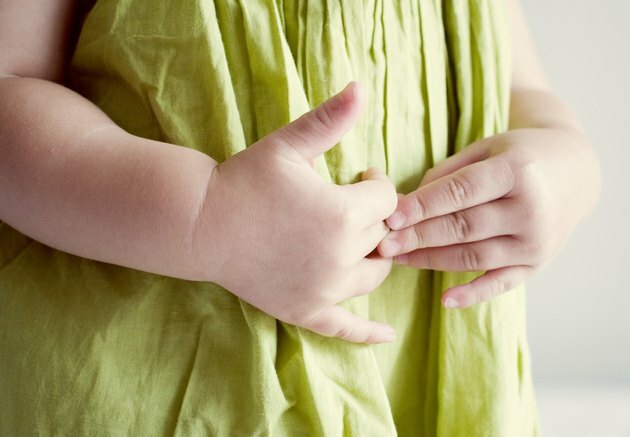 A child may require Tums or other antacids if he suffers from an uncomfortably gassy stomach, heartburn, esophagitis or gastroesophageal reflux disease. In these cases, the antacid may be taken alone or in conjunction with other drugs prescribed by your doctor. Unlike some other commercial antacids, Tums can also be used as a calcium supplement. Five-year-old children can safely take the children's version of Tums as a daily supplement. If you give your child Tums either as stomach relief or as a calcium supplement, be aware that some children suffer from side effects related to antacids. Regular antacid use can cause diarrhea, problems with digestion, bloating, electrolyte imbalances and a decrease in the child's ability to absorb nutrients. Long-term antacid use can also cause serious problems, including the risk of gastrointestinal infections, impaired kidney function and an increased risk of contracting rickets. If you overuse antacids you also run the risk of the medication becoming less effective over the course of time. Your 5-year-old child may have special dietary concerns that make antacid use unsafe or inappropriate. Unlike some brands, Tums Kids are both Kosher and gluten-free, so they can be used by children who are Kosher for religious reasons or who suffer from a gluten intolerance. They are not, however, casein-free. This means that they can be used by children with lactose intolerance but are not safe for children with severe milk allergies.